Smartphones, laptops and the rise of mobile wireless internet have made it possible to work around the clock, from office, train, home or bar. And, contrary to previous studies, this make us happy, reckons new report. Remember the hacyon days of the 9 to 5? The days when when leaving the office meant leaving work behind? The dim, rose-tinted past, free from the tyrannical BlackBerry and the ubiquitous iPhone? Well, it turns out us Brits don't miss those days at all. We have embraced the new 'always on' era, powered by technology - and we're happier than ever. At least, that's what US business magazine Forbes reckons. It has undertaken a study, in association with advertising agency Gyro, looking into the work/life balance of 111 working Brits. And it can now report that while 97% of the UK’s business community admit to being 'always on', sending work-related emails outside of the 9 to 5 working week, 84% of these feel 'better prepared and empowered due to a welcome and constant stream of information'. Crikey. These gluttons for the data are truly insatiable. 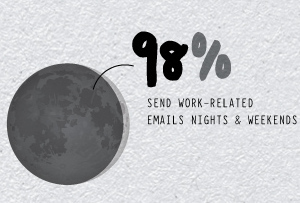 A third (32%) of respondents check their work emails every one or two hours and over half (52%) would happily step away from a family occasion (we're hoping this means dinner rather than, say, a wedding) to deal with a business issue. And yet despite being tethered to their virtual lives, they say they are in control of their free time; only 15% said they struggle to separate work from leisure.